Take in the Barbados sea air at this beautiful villa located right on Paynes Bay Beach in Saint James. Your days can begin sitting on the balcony. Take in the Barbados sea air at this beautiful villa located right on Paynes Bay Beach in Saint James. Your days can begin sitting on the balcony, overlooking the ocean with a fresh juice or cup of tea in hand. Embrace open plan living in the villa, with large double doors opening out on the garden and the ocean, so whether you are sitting inside reading or outside enjoying the sun everyone can still talk and be part of everything that is going on. The kitchen is well equipped, so you can prepare feasts with incredible local delicacies and enjoy them at the large dining table in the middle of the living room, or outside on the patio. Beach Villa at Mahogany Bay has three bedrooms, all of which are equipped with televisions and have balconies overlooking the garden and beach - so you can take in the ocean views from the moment you wake up. The master suite has an en-suite, a seating area and a walk-in wardrobe, while the other two twin bedrooms are downstairs, also with en-suite bathrooms. Each room is bright and airy, with tropical-inspired bedding and colours illuminating up the rooms. There's also a half bathroom in the villa. No matter where you are in this home, you can appreciate and take in the ocean views, but for prime viewing pull up a seat outside in the beachfront garden. There's even a wet bar by the plunge pool, so you can mix up a cocktail while lazing about. The white picket gate opens out onto the beautiful sandy beach, where there is amazing snorkelling. This villa has an amazing location, and is the perfect cosy home away from home. Beach Villa at Mahogany Bay has a privileged spot along Paynes Bay Beach. This 3-storey, 3-bedroom villa is a real treat for a small family or group of friends who want to enjoy an authentic Bajan holiday. Remember, the Plunge Pool may be small but the Sea is vast! It's no surprise Barbados is famed for its beached, they're like postcards come to life. If you want to lay on golden sand beaches, watch candyfloss sunsets take light in the sky and sip on fresh coconuts - Barbados should be on the top of your holiday list. It's the perfect place to relax and embrace the slower pace of life. It's a place known for its beaches, its sun and its friendly and welcoming people, so it's no surprise that you will never want to leave - you will feel as though you left part of yourself in Barbados. There are many beautiful beaches to enjoy from Miami and Rockley Beach to Bottom Bay and Mullins Beach. And if you're visiting Barbados, you want to spend as much time as you can exploring the renowned beaches, you also want to embrace the local culture, and try the national dish of Cou-Cou and Flying Fish. The two main towns, Speightstown and Bridgetown, are well worth a visit. The former is a town full of character, mostly due to the architecture, with historic buildings that date back to the early settlement of Barbados, which are contrasted with the modern buildings, which shows the developing nation. While the latter is a UNESCO World Heritage Site and the capital, so there's plenty to see and do here. 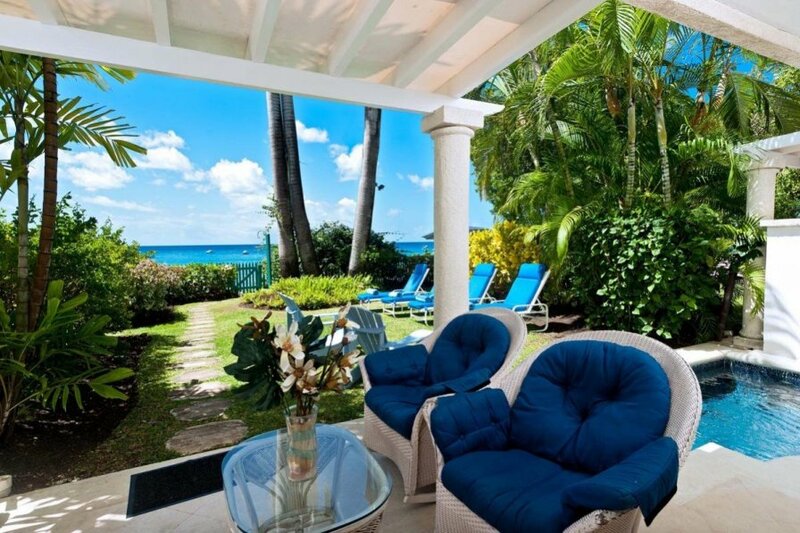 This villa is located on Paynes Bay Beach in St. James a parish on the west coast of Barbados. It's an upscale area, with many beautiful resorts dotted along the coastline - it's in close proximity to Sandy Lane hotel if you fancy some celebrity spotting. This area has beautiful white-sand beaches so it's no surprise everyone loves to visit the area - the nightlife and designer shops are also a drawcard for many tourists. It happens to be home to Holetown, the town that was the site of the first British settlement in the 17th century.